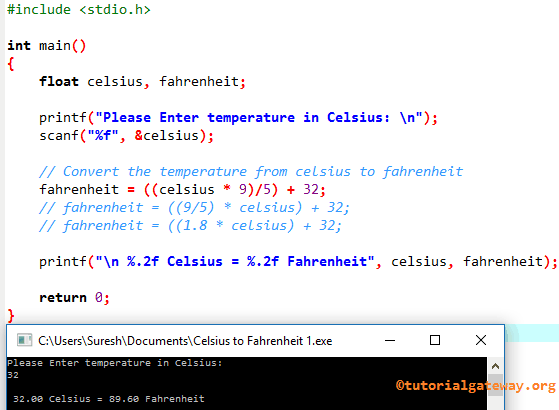 In this article, we will show you, How to write a C program to convert Celsius to Fahrenheit with an example. This C program to convert Celsius to Fahrenheit let the user enter the temperature value in Celsius. Next, we are going to convert the user specified temperature in Celsius to Fahrenheit in C.
Within this C program to convert Celsius to Fahrenheit example, the following statements will ask the user to enter the temperature value in Celsius, and the scanf statement will assign the user entered values to already declare variable Celsius.